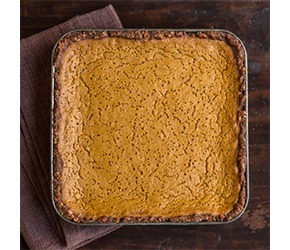 This one was a culinary conundrum: how to make a certifiably delicious, completely over-the-top pumpkin filling without the refined sugar blast of condensed milk in pumpkin pie filling? The answer was in a combination of molasses and coconut milk, which gives the kind of mouthfeel that had my husband, Gregg (who considers pumpkin its own food group), giving this recipe a thumbs-up. If you haven’t encountered the gluten-free grain teff before, it’s a true nutritional powerhouse – and the tiniest whole grain in the world’ a hundred grains of teff equal one wheat kernel. I love teff’s light, nutty taste, which perfectly complements the cashew in this tart. Preheat the oven to 375 F. Lightly grease 9-inch pie plate with a neutral oil. To make the crust, in the bowl of a food processor, combine the cashews, teff flour, baking powder, and salt. Process until the cashews are broken into fine bits. Transfer the mixture to a bowl and add the ghee and maple syrup; stir to combine well. Spoon the mixture into the prepared pan and, using your fingers, press firmly into a thin and even layer to the top of the pan. Bake for 15 minutes. It will have puffed up a bit, so cool on a cooling rack for 10 minutes before filling. It will settle into the pan. Increase the oven temperature to 400F. To make the filling, in a large bowl or stand mixer, lightly beat the eggs (they should not get foamy). Add pumpkin, salt, cinnamon, ginger, cloves, allspice, and nutmeg and stir to combine. Mix in the maple syrup, molasses, and coconut milk. Pour into the warm tart shell and bake for 15 minutes. Reduce the oven temperature to 350F and continue baking for another 30 to 40 minutes, until the filling no longer jiggles and has small cracks in the surface. Serve in thin slices.